How I Lost 200 Pounds! 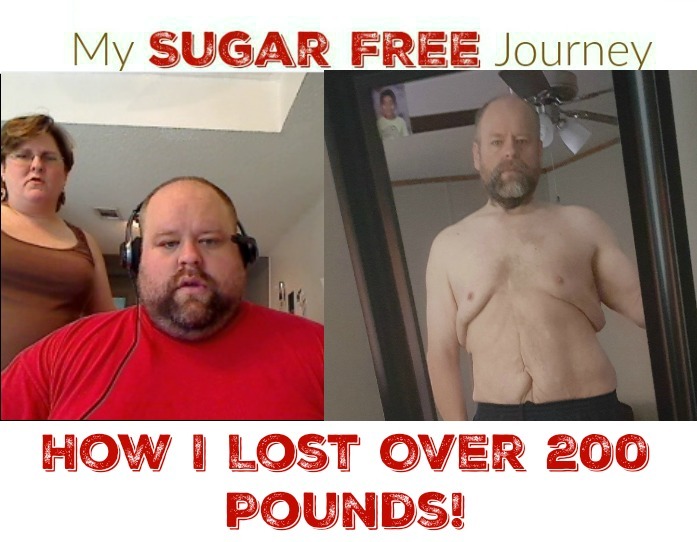 In this week’s My Sugar Free Journey Podcast, I am sharing m journey to lose 200 pounds! I recently hit a MAJOR milestone in my weightloss, one I have been working towards for over 3 years now. Yes, I am officially under 200 lbs for the first time in my adult life! I haven’t seen my weight start with a one since Junior High roughly 30 years ago. I started off at the hefty weight of 400 lbs so I am half the man I used to be which is pretty amazing. But it has been a LONG journey and although I have kind of piece-mealed my story out and told in several different places, I wanted to put the whole thing together in one place so everyone can see it and find the entire journey. This will also be recorded as a video and podcast so everyone can see and are included below. This whole journey started as I was approaching my 40s. I have always been heavy but really had no idea how heavy or what that weight was doing to my body. I went to one of those free clinics that pop up every once in a while at a CVS and got a few tests run. That was when I discovered that my blood pressure was not just high but completely out of control. I always knew I had a tendency towards high BP but never paid much attention to it. I still remember the look on that poor technicians face when she started up the machine and watched the numbers climb higher and higher. In fact, when she saw the final reading of 220/175, she assumed the machine had malfunctioned and put it on the other arm to run another test. But no, that was pretty accurate. The crazy thing is that’s not even the highest I ever saw as one time a paramedic tested me at 237/180. Just crazy! When I saw that number, that’s when the realization that I had lost both my maternal grandparents to high blood pressure and Cardiovascular disease and that I was in trouble. And since all this happened, I have also lost my father to a stroke brought on by high blood pressure. It was thinking about my grandfather dying of a heart attack that really pushed me to make a change because I absolutely adored that man and still miss him. His death was a pivotal moment in my life and not for the better and all I could think about was my beautiful grandkids and how much they mean to me. The thought of affecting their life in a terrible way because I wasn’t taking care of my health was too much to bear. It was also around this time that I was diagnosed with Metabolic Syndrome which basically means that I was so fat everything was breaking down all at once. Another reason I had to get the weight off. But how exactly do you lose weight? I of course, knew exactly how to lose weight. It was simple science. All you needed to do was to eat less and exercise more. Couldn’t be easier so that’s what I dd. I would portion control and start different diets and did great on all of them until my willpower ran out and I would plateau and eventually all the weight came rushing back on. I could never figure out why it was so much easier to put weight on than it was to take it off. The one crazy thing I did that really drove home to me how stupid these crazy diets are was my brief flirtation with juicing. I stayed up late one night watching Netflix and came across Fat, Sick and Nearly Dead. This is the story about how a guy started juicing all his food and lost weight. I watched this doc and thought, “That is something I can absolutely do.” I Amazon Primed a juicer and bought tons of fruit and veggies. For probably a month, I did not eat solid food. Just a fruit juice in the morning and a veggie juice for dinner and water. Did I lose weight? You better believe I did. I don’t know how much I lost but it was enough to keep me going despite the fact that I felt horrible and had absolutely no energy. One night I was swimming my laps at the pool and didn’t even have the energy to put my arm over my head for another stroke. I floated to the edge of the pool and gathered up the strength to get out of the pool and go home. I didn’t know what I was doing wrong. The guy in the documentary never complained about feeling lousy, he kept talking about how great he felt all the time. So I just couldn’t do it anymore; I stopped the juicing and went back to eating like a normal person and the weight crept back on. Soon I was probably over 400 lbs again, I say probably because I never weighed myself. I still remember the first step along this Sugar Free Journey of mine. It was the middle of the night and I was messing around on the computer reading different websites. I wasn’t looking at anything specifically health related but I didn’t realize how my life was about to change for the better. I stumbled upon an article on Yahoo about a woman named Eve Schaub and how she went a year without sugar and wrote a book, Year With No Sugar. I read the article and for some reason it piqued my interest enough to click over to Amazon to see how much the book was. I don’t remember the exact dollar amount but the thing I absolutely remember was that the Kindle version had a pretty steep discount and was almost exactly what I had available on an Amazon gift card that I thought I would never use because it only had about 3 or 4 dollars left on it. I figured that was a sign so I bought the book and through the magic of Kindle technology, I had it available to read instantly. Now this was not a weight loss book as Eve and her family didn’t have much weight to lose but it was in that book that the first really big piece of this journey fell into place. She mentioned a video by Dr Robert Lustig called Sugar: The Bitter Truth and recommended everyone watch it so I did. It was this video that opened my eyes to the source of all my problems, sugar in general but specifically the fructose in sugar. I was hooked! This idea of sugar being at the root of everything that was wrong with me was so simple and clear that I decided right then and there to never eat anything with fructose in it ever again. I didn’t know at the time how difficult this was going to be because sugar is in everything and almost impossible to escape from. The thing that opened my eyes to what I signed up for was when I cooked one of my first sugar free meals and went to put garlic salt on my homemade french fries (clearly wasn’t keto yet!) and happened to look at the ingredients for the garlic salt and right there between the salt and the garlic powder was sugar! Who puts sugar in garlic salt? This blog became a way to not only keep all this information together but became a place where I could post new recipes I was trying out and a way to keep myself accountable. My Weightloss Wednesday posts became the cornerstone of the blog. I knew that whatever happened, I had to check in and even if no one was watching, I needed to be able to say something about what was going on with me. I didn’t really know it at the time but it was the WLW posts more than anything else I did here that kept me moving and was far and away the best idea I had. The next step in my journey happened in May of 2014. That was when I was listening to a podcast that typically dealt with online business matters called Smart Passive Income by Pat Flynn. In his May 16th, 2014 episode he interviewed a trainer named Vinnie Tortorich and he told his story about how he was helping people lose weight by getting them off of sugars and grains and talked about his podcast that covered that same idea. This was a life-changing event for two reasons, #1 it opened my mind up to the idea that I didn’t just have to read books to figure out this new way of life but could listen to podcasts while I was out walking the dog or whatever I was doing and #2 it brought Vinnie specifically into my life and his show has been a staple of my education from day forward. In over 3 years, other podcasts have come and gone from my feed but I have never missed an episode of Vinnie and listening to him was a key part of the decision to launch my own podcast, The My Sugar Free Journey Podcast. Vinnie’s message of No Sugars, No Grains (what he calls NSNG) struck a chord with me because by this time I had learned about the role of insulin in weight loss and knew that if not eating sugar was helping me to lose weight than not eating sugars and grains would only speed the process along faster. Eventually I made the switch over to NSNG and the weight continued to come off and the next step in my progress was made. I pretty much stayed NSNG for the rest of 2014 but continuing my education helped me to discover the next piece of the puzzle, the fact that fat was actually good for you. Not the fat on your body but the fat in foods like meat, butter, olive oil, etc. This was the one part of the journey that really took me a while to wrap my head around because I had always been taught to avoid fat because it gives you a heart attack and I certainly wasn’t going to go to all this trouble to lose weight and drop dead of a heart attack! Eventually though, the number of podcasts I was listening to and the books I was reading made a strong and compelling argument that a diet high in saturated fat was not only a good thing but how humans were designed to eat. I spent most of 2015 moving more towards LCHF and eventually on Jan 1, 2016 I made the jump into a ketogenic diet and never looked back. The Keto diet served me very well over the last year and a half or so and I saw the biggest losses on the scale when I went fully ketogenic. Eventually I read Dr Fung and Jimmy Moore’s collaboration, The Complete Guide to Fasting and I mixed in some Intermittent Fasting to my ketogenic diet. In fact I will be featured on an episode of Fasting Talk with Jimmy Moore in a few weeks and will link to that as soon as it comes out. Every 10 pounds I lost from the start of 2016 at 300 lbs, I took a pic of the scales and put them on Instagram and vlogged through the Weightloss Wednesday posts so I wanted to share those dates with you here because I think it’s important to show people how long the process is. I spent over 40 years ruining my health so fixing it didn’t happen over night. It took me 3+ long years to get here and I’m not done yet. After the dates I have included the time it took for me to reach that benchmark from the previous benchmark. Sorry I don’t have the data from 400 to 300 lbs but I wasn’t really tracking things at the time. You know, I have never written out how long it took me to get from goal to goal but looking at it now, my weight loss was far steadier than I realized as most 10 pound increment was reached within about 2 months of the last one. The biggest exception being that it took me 3 months to get from 210 down to 200. It certainly didn’t feel steady at the time but that’s why it’s helpful to look back on these things and see them from a bird’s eye view. Since reaching this huge goal, I have given some thought to what my new health goals should be. I want them to be big enough that they will take a year or more to reach but not so big that they will be impossible. So I’m taking this opportunity to write them down so I have them in my own head moving forward. 170 lbs – When I look my ideal weight up on a chart, it usually says that the ideal weight for someone of my height is around 160 lbs. I figure I have at least 10 extra pounds of loose skin hanging around so I think 170 is a good goal. Mainly, I just want to continue to lose weight. 35″ Waist – They say your waist need to be half your height so 35″ is where that needs to be for me. I’m at about 45″ right now so I’ve got a little ways to go. 120/80 – I have never been anywhere close to a normal blood pressure so I would like to see something close to those numbers. Muscle Building Exercises 3 times a week – Right now I’m all about the kettle bell so I will stick with that but I need to be more regular with the exercises. I’m not the most faithful exerciser in the world and need to get into a regular rhythm. Running – I have no intention of starting this anytime soon but I’ve always kind of wanted to be one of those people who could run long distances. There are probably a few things I need to do first to toughen up my joints and whatnot but I’ve always thought that being a runner would be cool. Will this ever happen? Not sure but I don’t want to lose sight of what for me would be the ultimate health stretch goal. I have a few regrets about this journey but they are small. #1 I wish I would have started sooner. Not only would I have gotten healthier faster but maybe I could have prevented all the cavities in my teeth. Right now, every meal requires a floss pick to clean out the meat that gets crammed in between teeth and into small cavities. More annoying than anything. #2 I wish I still had my wedding ring. I was just starting off cutting out the sugars and grains when I went to put my seatbelt on in the car and my wedding ring flew off my finger, never to be seen again. This was my first insight into how badly inflamed I was from the grains because I hadn’t lost all that much weight. It was cool that the inflammation in my hands went down enough for that to happen but I wish I still had the ring I said my vows with. I’d like to take a minute to thank the people that had some input into my life over these last 3 years and helped me along in my journey. Dian – My lovely wife who makes all this worthwhile. If I didn’t have a woman worth getting healthy for and living a long life with, none of this would have happened. Vinnie Tortorich – Yes, I’ve already discussed him but he was so important to this journey that he deserves another mention. Do yourself a favor and listen to his podcast. Jimmy Moore – His podcasts have helped as well, especially the Keto Talk podcast as it is keto-specific. All the other podcasts I listen too – There are a lot in my queue so I’ll just list them and you decide the ones that are worth your time. The Model Health Show, Ultimate Health Podcast, 2 Keto Dudes, Low Carb Conversations, The Fat Burning Man and of course my own podcast, The My Sugar Free Journey Podcast. I realize that’s a lot but keep in mind that I can listen to podcasts while I work so I essentially have 8 hours a day I can fill with whatever I want to listen too. Sharon Cannon and Jackie Gonzales – When I started my FaceBook support group for this way of eating, these 2 women were among the first to join. Now they have both lost a lot of weight, reversed their markers of metabolic disease and assist me by being admins in the group. They make my life so much easier and I love having them along in this journey with me. If you would like to join us, sign up for the Ketogenic Meal Plans here. The main thing I will be focusing on now is continuing to grow my 28 Day Ketogenic Challenge group and would love to see you there! So that’s how I did it. Mostly by not eating sugar and eating more fat. Super simple but the results have been amazing! If you need help or have questions, please do not hesitate to reach out to me here or leave me a comment below. Thanks! PREVIOUS POST Previous post: 7/12 Weightloss Wednesday: My Body is a Onederland! NEXT POST Next post: 7/19 Weightloss Wednesday: Still Losing! Ty for the inspiration! Congrats!! I get excited now when I hear a story like this, another person gets it! I’ve been losing weight since last year and made good progress, but I just found Vinnie Tortorich a couple weeks ago. WHERE WAS HE ALL MY LIFE. I was already low sugar and low grains, because of my vague understanding of diet and knowing carbs was a slippery slope to over eating for me, but Vinnie was the final piece of the puzzle to why I need to cut it all, and how weight loss really works. That was my final piece of the weight loss health puzzle. It’s an amazing feeling to know you have full control of your body with ease, and know that you’ll never lose control again. Top it all off, my energy has been up :D. I’ve struggled with low energy since high school, doctors couldn’t help. I actually want to work on my house, and go for bike rides. The energy is what got me. Once the weight started coming off and I could get through my day without a nap, I knew I found what would work!